The last 24 hours have been so fun. First, after waiting about 6 weeks, I found out that I won the refashioned bag competition. Do you remember this bag? I blogged about it here. I won a $50 Gift Certificate to spend at Fat Quarter shop. That won't be hard to do. Thank you to everyone that voted for me and thanks to Sewing Summit for the challenge. This morning when checking Flickr I saw that Ayumi posted the photos she took of the 2012 Partnership Quilts at the Tokyo International Quilt Festival. I blogged about my contribution here and here. This was the block that I sent. I was happy with it but wish that I would have done a better block. But when I saw it sewn into this quilt I got chills. All those beautiful house blocks and mine is among them. I am so happy and honored! 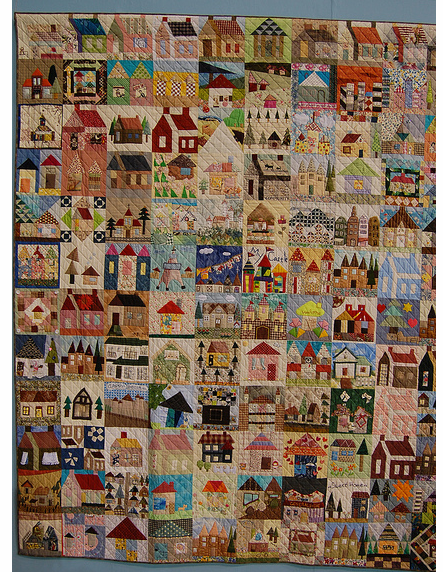 You can see more 2012 Partnership Quilts here on the Flickr site. Oh wow! Good for you Di! I loved your bag and certainly voted for it! And look at that amazing house quilt! Good things happen in threes- is there something else wonderful about to happen?!! Lucky you! I have yet to make something with my selvages, but I think Jeni's bag is the perfect project for it! Oh clever you!! A deserved win - it is absolutely gorgeous and enjoy your winnings. As you say, it won`t be hard will it? 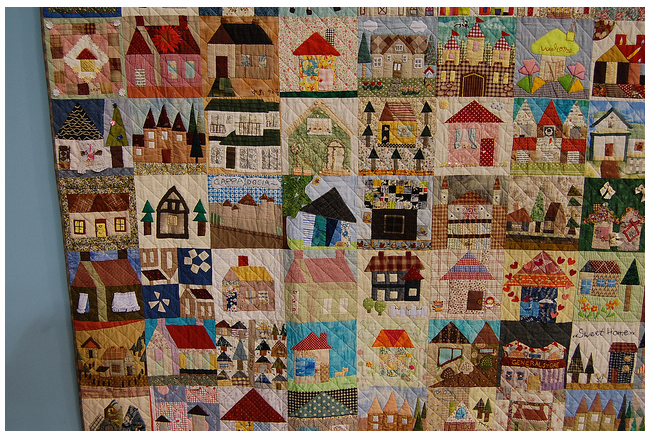 I feel a bit sad when I see the Tokyo quilt as I didn`t send my block off in the end as I wasn`t happy with it. Next year perhaps! Double congratulations! Happy shopping and how nice to see your block there with all the others. I love the way the house quilt came out - it's really beautiful! Congrats on winning the bag competition! The drawstring bag is so nice! I was so happy to spot your cute house there! Such a beautiful quilt full of interesting houses! I'm so excited for you! Congrats. Ooops I raced off to see my block - Ayumi is such a sweetheat, and forgot to come back! Oh and congratulations - my voted counted!! 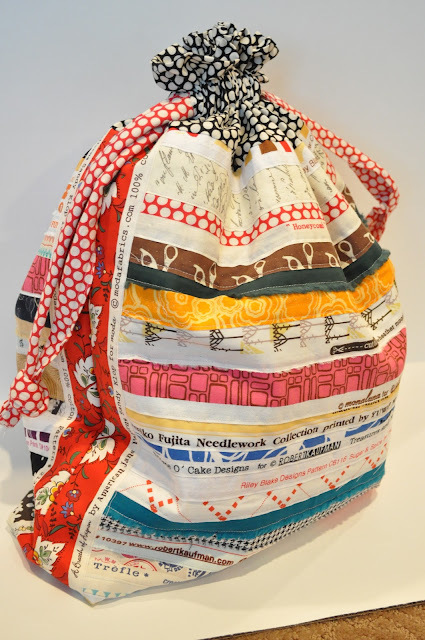 Congratulations on winning, I love your bag and the block looks great in that quilt. Wow that partnership quilt is spectacular! And I really liked your block! Congrats on winning a fat quarter GC! That's awesome!